Recently, an AccurateShooter team including contributing writer German Salazar visited the Nammo Talley facility in Mesa, Arizona. We were given access to the new Rimfire Service Center and the .338 Lapua Magnum loading facility. The Rimfire Service Center is a brand new facility dedicated to supporting top-level rimfire shooters in all disciplines, including Prone, 3-Position, Silhouette, Benchrest and more. Lapua has over 2 million rounds of various grades of match ammunition on hand for shooters to test and purchase. 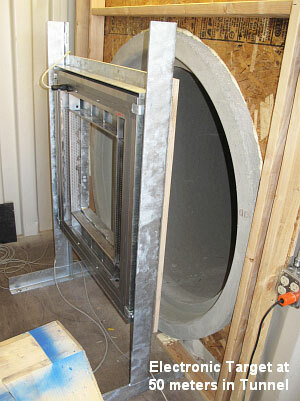 The RSC has a 100-meter test tunnel where groups are measured under ideal conditions with electronic sensor-equipped “paperless” target frames placed at 50 meters and 100 meters. 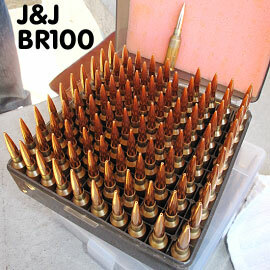 Shooters can make appointments to visit the center and test ammo in their own rifles. A detailed report on the RSC has just been released on German’s Rifleman’s Journal website. CLICK HERE for Rimfire TEST CENTER ARTICLE. 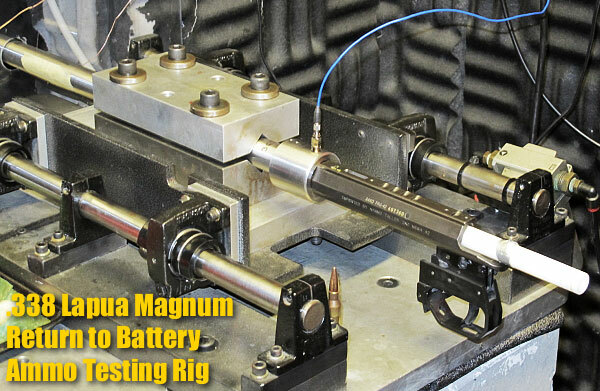 The .338 Lapua Magnum facility is a super-sized version of the rimfire facility. With a 300-meter tunnel and pressure testing equipment on hand, Nammo’s engineering and loading staff have the ability to develop perfect loads for government clients with a variety of specific requirements. The loading facility has equally impressive technology and is well worth reading about. CLICK HERE to read German’s article about the .338 LM facility. AccurateShooter.com will have more information on these two state-of-the-art facilitites, including video footage in the coming weeks. So stay tuned! Share the post "Salazar Spotlights Lapua Rimfire Service Center and .338 LM Plant"
The Dolphin Gun Company, based in the United Kingdom, has developed a very stable, yet lightweight wide-base bipod, ideal for F-TR shooters. We expect Dolphin’s new Trakker bipod will also be popular with varmint hunters and some tactical shooters. Trakker bipods are available in two confirgurations, “Standard” and “Long”. Perhaps they would be better named “Wide” and “Extra-Wide” — the “Long” version has extended legs which can provide a wider base and/or extra elevation. Both versions provide a very stable platform for prone shooting, and both versions are available with either Sling-swivel or rail attachments (see photos below). Here’s the great news — these Trakker bipods are very light, yet sturdy. The standard version weighs just 21.2 ounces (600 grams), while the long version tips the scales at 24.7 ounces (700 grams). This will help shooters “make weight” in F-TR class even if they have a very long barrel, or jumbo-sized scope. Trakker bipods are offered with multiple color choices: natural (silver) alloy, matte black powder coat, or other powder coat color of the customers’ choice (extra charge may apply for custom colors). Dolphin’s Trakker bipods have been extensively tested by top F-TR shooters in Europe and we have heard that these bipods work extremely well. They are stable yet easy to adjust, and they are quite a bit lighter than most wide-base bipods on the market. Retail price in the UK is £165.00, which translates to $267.00 US Dollars, but this does not include overseas shipping or possible customs charges. Americans can order direct from Dolphin at this time and Dolphin will ship to the states. (Dolphin is currently in discussions with a US-based company that would produce the Trakker bipod for the North American market, under license). For more information, visit DolphinGunCompany.co.uk or email mik [at] mikdolphin.demon.co.uk. NOTE: The Dolphin Gun Company website is pretty slow. You may have to try multiple times to load the pages. Dolphin Gun Company was formed several years ago by Mik Maksimovic and Pete Hobson, two active, competitive F-Class shooters. Both Mik and Peter come from engineering backgrounds. 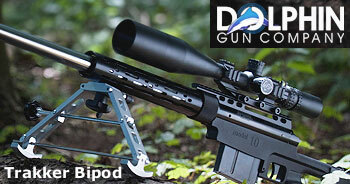 They first set up Dolphin Gun Company to build their own competitive shooting gear. From hobby gunsmithing and preparing their own rifles and equipment, Mik and Pete quickly progressed to building rifles for other shooters and creating top-of-the-line shooting accessories such as the Trakker bipod. Share the post "New Wide-Base Trakker Bipod Systems from the UK"
About 24 miles east of Oceanside, California (near the Camp Pendleton Marine base) is the Pala Reservation. On that Native American land you’ll find a Casino Resort, plus an excellent shooting range. 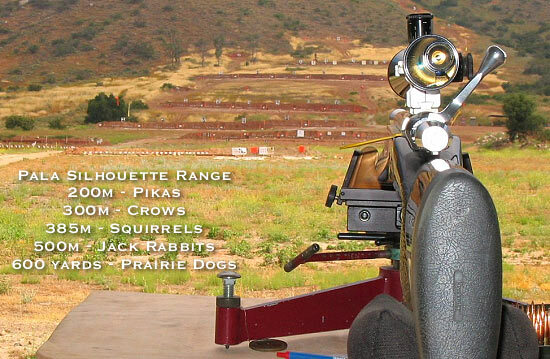 Each month, shooters come to Pala for the Varmint Silhouette Match hosted by the North County Shootist Association. Normally there is one match, held on the first Sunday of even month. But in May, you can “double your fun” because there will be TWO (2) matches. The first will be held this Sunday, May 6th, 2012. The second match takes place on Sunday, May 20th. On both match days, gates open at 7:30 am with practice from 8:00 am to 9:00 am. On Friday, May 4th, the range will be open for practice 9:00 am – 1:00 pm, while on Friday, May 18th, the range opens at 10:30 am. At five different yardages, ten steel “critter” targets are set as follows: 200 Meters – Field Mice (“pikas”); 300 meters – Crows; 385 meters – Ground Squirrels; 500 meters – Jack Rabbits; 600 yards – Prairie Dogs. The folks at Pala run a tight ship, cycling multiple relays efficiently, so everybody gets to shoot 50 targets (10 each at five different yardages), and the show is usually completed by 1:00 pm. There’s a one-hour sight-in period starting at 8:00 am, and the match starts at 9:00 am sharp. Newcomers should definitely arrive no later than 7:45 am, because you may need that full sight-in period to acquire solid zeros at all five yardages. CLICK HERE for full match INFO. You’ll need an accurate rifle, plus at least 80 rounds of ammo (bring 100 rounds if you have no idea about your come-ups at these distances). You can shoot either rested prone (F-Class style), from bipod, or from a portable bench with front pedestal and rear bag. Most guys shoot from benches. Any rifle 6.5 caliber or under is allowed, with no weight restrictions. Any good varmint rifle can be competitive. Muzzle brakes are permitted. Spotter assistants are allowed, so bring a friend along — he/she can shoot in a different relay. Bring cleaning gear if your rifle can’t run 80+ rounds without losing accuracy. Pastry snacks are often provided, but bring water, a sandwich and your preferred non-alcoholic beverage. You’ll spend some time in the sun helping to set targets, so bring a hat, sunglasses, and sunscreen. There is a deluxe Indian Casino/Spa a half-mile from the range. So don’t hesitate to bring the wife. If she’s not a shooter, she can enjoy a fancy brunch or spa treatment while you’re having fun mowing down metal critters. Pala is a 30 minutes from the Pacific Ocean and beautiful beaches, so you can make this a weekend holiday for the whole family — kids love sand and surf. 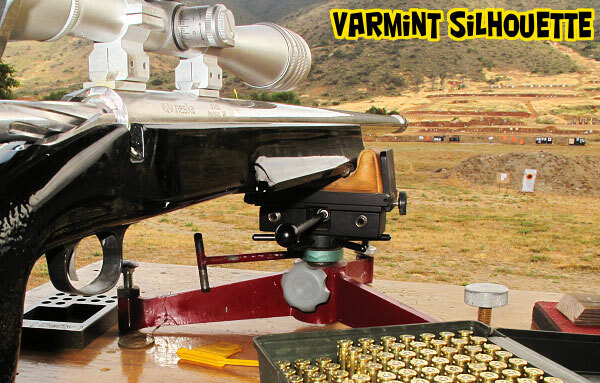 Share the post "Double Dose of Varmint Silhouette Action This Month at Pala, CA"